One reason for it's lack of 'fame' is, of course, the fact that Stalin must take much of the blame for the way the initial German offensive (which had started the previous day, June 22, 1941 - some 5 weeks late, mainly due the Hitler wasting time (and diverting resources) into taking Greece after Mussolini had attacked and failed), rolled over everything in it's path. On on June 23 five complete Soviet Mechanized Corps plus one Tank Division (under Gen. Mikhail Kirponos) launched a counter attack against the 1st Panzer Group that was advancing east on the front between Lutsk and Brody (along the line Tartakow - Beresteczko - Dubno - Shepetovka), toward Kiev some further 400km due east (and which they captured in September). The 22th, 9th & 19th MC + 21st RC attacked south (along the Lutsk-Rovno front) whilst the 15th and 8th MC attacked north from the area of Brody. 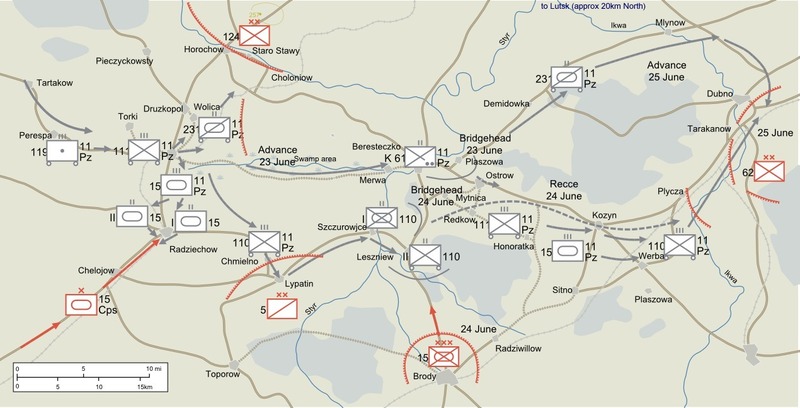 At the same time, the 27th RC held the line to the north (at Lutsk, against the German 17th and 29th) whilst the 4th MC held the line at Lvov (against the German 4th Infantry). 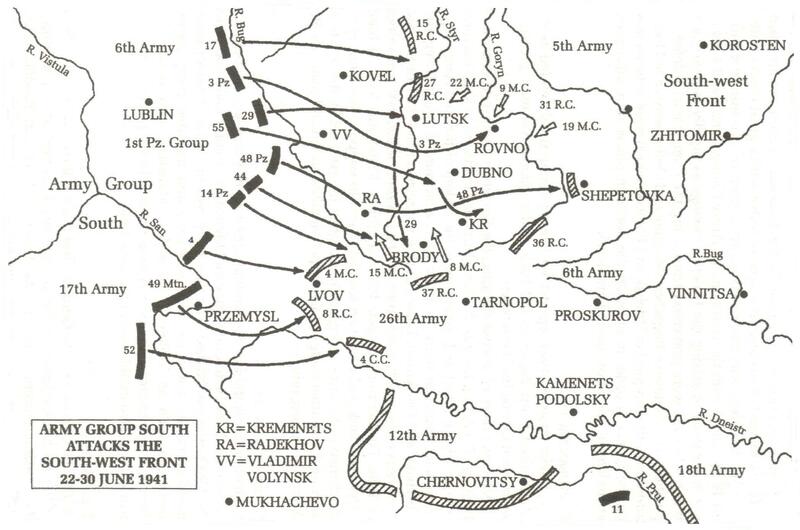 The 'battle' that took place in the Lutsk, Dubno and Brody triangle resulted in the usual (at this time) slaughter of most of the Soviet forces engaged. Out of approx. 5,000 tanks, the Soviets lost 2,648 during the actual battle (over half of which were lost as a result of mechanical breakdowns, rather than German direct attack). On the other hand, the German 1st Panzer Group (which started Operation Barbarossa with approx 1,000 tanks) had only lost about 100** tanks in total during the first 2 weeks of the war (which included the action at Brody/Dubno). On that same date (July 7), the five Soviet mechanized corps that had participated in fighting in the �Brody Triangle� reported a total of only 679 operational tanks remaining (so 4,321 lost), giving an overall loss ratio of 43:1 ! The tank battles were fought between the 1st Panzer Group's III Army Corps and XLVIII Army Corps (Motorized) along with five mechanized corps of the Soviet 5th Army and 6th Army. Although the Red Army formations "inflicted heavy losses on the German forces"**, their tanks were totally outmanoeuvred and suffered enormous losses in the 25:1 region. Poor Soviet logistics, German air supremacy and the usual (at that time) total breakdown in Red Army command and control ensured victory for the Wehrmacht, despite the overwhelming Red Army numerical and, arguably, technological superiority. **Gen. Konstantin Rokossovsky of the 9th Mechanized Corps, ignoring an order to continue counter-attacking, set up an ambush that caught the 13th Panzer Division advancing on Rovno. The Soviet artillery then inflicted many casualties on the advancing German forces, however since this was only achieved by ignoring a pointless (and suicidal) 'frontal attack' order, it's perhaps not surprising that few details were revealed at the time. Without doubt the Soviet KV and T34 tanks of this time were individually far superior to any Panzer in terms of armour and armament. However, despite this advantage, almost everything else combined to ensure the Soviet forces would be defeated. First off, all Soviet tanks were exceedingly unreliable - indeed, when the 8th Mechanised Corps (of D.I. Ryabyshev) was rushed (on 24th June) toward Dubno, the half of its vehicles were lost to breakdowns on the way ! Command and control of the T34's was crippled by the lack of radios and the cramped 2 man turret, which meant that the 'commander' also had to act as gunner (or loader). When added to the poor crew training (and, I would suggest, exceedingly low morale) this meant that the Germans typically got off 3 shots before the T-34 crew managed one. Whilst the T-34's 76.2mm (medium calibre) gun was superior anything the Germans had at that time, it was hard to aim using the poor quality optical sights (and under-powered turret traverse motor) so any 'long range' shots (beyond 500m) usually missed. If all that wasn't enough, when they did manage a hit, the poor quality of the Soviet A-T ammunition often meant the shell simply shattered on impact. However, in the end it was the superior flexibility of the German tank crews, with radios in every tank and training that focused on initiative and the seizing of opportunities (rather than the Soviet 'stick to the plan' approach) that allowed their tanks (and anti-tank guns) to get around the sides and rears of the Soviet formations, from where the German guns were (at least partially) effective. Further, when it became apparent that the their anti-tank guns were ineffective against the T34/KV's, the Germans immediately deployed their 105 mm field guns and 88 mm anti-aircraft guns in a direct fire role. Of course the fact that most of the Soviet air-force had been destroyed on the ground the previous day (were Stalin had insisted they stay, despite the obvious German attack preparations) meant the Germans had almost total air superiority. Good co-ordination between ground and air resulted in a number of Soviet T34/KV losses to German aircraft (especially the Stuka), although the majority of the 201 tank 'kills' claimed by the Luftwaffe will have been the lighter BT-5/7s and T-26 types. The final 'nail in the coffin' of the Soviet forces was their hopeless logistical situation, with essentially no provision being made for re-supply. Many Soviet tanks ended up being abandoned by their crews when they ran out of ammunition and/or fuel as the Luftwaffe knocked out the front line ammunition dumps during the first few hours of the invasion and 'interdicted' any attempt by the Soviets to bring up supplies from further afield. The Soviet plan was a 'converging attack' (pincer movement) from north and south designed to 'pinch off' elements of 1st Panzer Group which had pushed open a corridor between 5th and 6th Armies. 8th Mechanized Corps (12th, 34th, 7th Div), total 858 to 899 (reports vary), of which 71 KVs, 100 T-34s, 45 T35s (the remainder being BTs and T-26s) Note 2. 9th Mechanized Corps (20th, 35th, 131st), total 298-316 tanks, of which 135 BT-5 or BT-7 (the rest being T-26) Note 3. 19th Mechanized Corps (40th, 43rd, 213th), total 453, of which 5 KVs, 2 T-34s, 261 T-26s, and 152 T-37 tankettes. Note 3. In total, the 5 Mechanized Corps (and 1 Division) above detailed to make the attack had a total of some 3415 tanks of which 442 were KV/T34. A further 1509 tanks were (in theory) 'available', however in practice there was little or no chance of these moving fast enough to engage the German forces. As was usual, all the Soviet Mechanized Corps were well under 'book' strength, on average having only some 60% of their 'official' tank counts. Further the general poor reliability of the tanks (and poor mechanical ability of the Soviet crews), when combined with the abysmal state of the Soviet road system, resulted unbelievable breakdown rates 'on the way to the front'. Note 1. The 4th Mechanized Corps totalled 979 tanks (of which 313 T34, 101 KV). However only the 8th Tank Division participated in the battle, when they arrived on 28 June to screen the rear of the retreating MC 15 from pursuing German Infantry. It was not for want of trying - by 12 July the 4th Mechanized Corps were down to only 67 serviceable tanks in total (of which 37 T34, 7 KVs). This was all due to mechanical breakdowns, which accounted for 96% of their light tanks, 94% of their KV's but only 88% of their T34's. Note 2. The 8th Mechanized Corps fought as 2 groups = Popel with 300 tanks (of which 51 T34, 25 KV) and Ryabyshev with 303 tanks (49 T34, 46 KV). It fought hard but was decimated. By 7 July 1941 it had suffered over 95% losses (it was down to just 43 tanks out of approx 900). For it's troubles it was then disbanded and it's remaining assets assigned to other formations of the Southwestern Front. Note 3. The 9th and 19th Mechanized Corps (attacking from the north) ran straight into the anti-tank gun lines of the German 111th and 299th Infantry Divisions and got most of their old light tanks shot to pieces. It was Rokossovsky commanding 9th Mechanized Corps, who then disobeyed orders and mounted a successful ambush of the Germans. By the end of 26 June, the combined strength of the two corps was less than 70 tanks. 24th Mechanized Corps (45th, 49th, 216th), total 222. 109th Tank Division, total 209. 18th Mechanized Corps (44th, 47th, 218th), total 282. It's to be noted that the KV and T/34 tanks were virtually immune to the standard German 37mm (and even the brand new 50mm) anti-tank guns. However, it's also to be noted that whilst the KV and T/34 outclassed the Panzer, the Soviet anti-tank ammunition was of such poor quality that it often shattered against the comparatively thin (but face-hardened) German armour. All 3 Corps included a number of Panzer I (armed only with a machine gun) and Panzer II (armed with a 20mm 'cannon') tanks. In total the Germans had some 728 tanks, of which some 355 were marginally effective against the Soviet T34 (side and rear). The KV was essentially immune to all German tanks and anti-tank guns (the only vulnerable part being it's tracks), although the Germans quickly learnt to use their 88 AA gun and 105mm field gun against it. None of the German tanks were effective against the KV/T34 front armour, although the T34 was vulnerable to the 50mm gun from the side and rear (something the German tank crews achieved on a regular basis). Note 2. At this date, the Pz IV was still armed with the 75L24mm 'howitzer', intended to deliver HE in support of the infantry. However, despite it's low-velocity, it was equipped with solid-shot AP rounds and was capable of penetrating up to 43 millimetres (1.69 in), inclined at 30 degrees, at ranges of up to 700 metres (2,300 ft). This was of little use against the KV-1 armour (90/75/70mm) and even the T34 frontal armour (43-47mm at 60 degrees) proved immune. It was not until the spring of 1942 that the Panzer IV was fitted with the longer 75L43 gun. The Germans had near total air supremacy. The Luftwaffe provided close support during the battle so these aircraft must be added to the German forces. Once again, it was superior German tactics - in this case the close air-support of their ground forces and interdiction of the Soviet re-supply columns - that helped make a real difference on the ground. The Soviets did manage a few air-attacks, however these appear to have been largely ineffective. The Soviets even launched a number of fighters, however these were soon 'dealt with' by the Me109's, which (it seems) were 'reserved' for air-air combat and not used for direct ground support = so I've ignore the fighters available to both sides. The battle-field is approx 30 miles high (N-S) by 60 miles deep (West-East). The 9th and 19th Mechanized Corps (attacking from the north) ran straight into the anti-tank gun lines of the German 111th and 299th Infantry Divisions and got most of their old light tanks shot to pieces. It was Rokossovsky commanding 9th Mechanized Corps, who then disobeyed orders and mounted a successful ambush of the Germans. The 8th and 15th Mechanized Corps made a serious attack all the way into Dubno, mostly against elements of the 25th Motorised Division and 75th Infantry Division. Once in Dubno, the 8th Mech Corps was surrounded by 11th and 14th Panzer Divisions and cut to pieces. Since both Panzer divisions only started on 22 Jun with 143-147 tanks, (each division had about 45 PzII, 20 Pz IV, 8 - 13 HQ tanks, and the rest PzIII, with about 30-50% of the PzIII with the 37mm gun) these battles could have involved no more than 200 German versus 250-300 Soviet tanks. In all, the various battles in this Counteroffensive involved far more Soviet tanks attacking German infantry (and their antitank guns) without much infantry or artillery support of their own, than it did plain tank on tank action. This, of course, was exactly what the Germans were aiming for - suicidal Soviet 'charges' directed at the German anti-tank guns whilst the Panzers maneuvered around the flanks and rear to shoot up the enemy rear echelons before turning to surround the (surviving) Soviet tanks and kill them off one at a time. All the German forces start on the west edge of the map (more or less arranged along the 2 'roads' (dirt tracks). To 'win' the Germans have to take, and hold, all the towns on the road from Perespa to Dubno AND reach, and take, Dubno before 25 June. About half the Soviet forces start 'pre-deployed' on the map (mostly near the edges). The rest will arrive on the edges of the map (both top and bottom) along the roads (dirt tracks) during the game. Note, the Luftwaffe 'air-base' is positioned at Perespa. This makes it 'vulnerable' to attack by Soviet 15 Corps (elements of which are going to be arriving up the Chelojow road throughout the game). The A.I. of course, has to play the Soviet side (although a 'hot seat' (2 human player) game could be an interesting variation). This page last modified: 26th Sep 2017 17:34. Page Clicks to date: 1. User 54.90.86.231 @ ec2-54-90-86-231.compute-1.amazonaws.com.